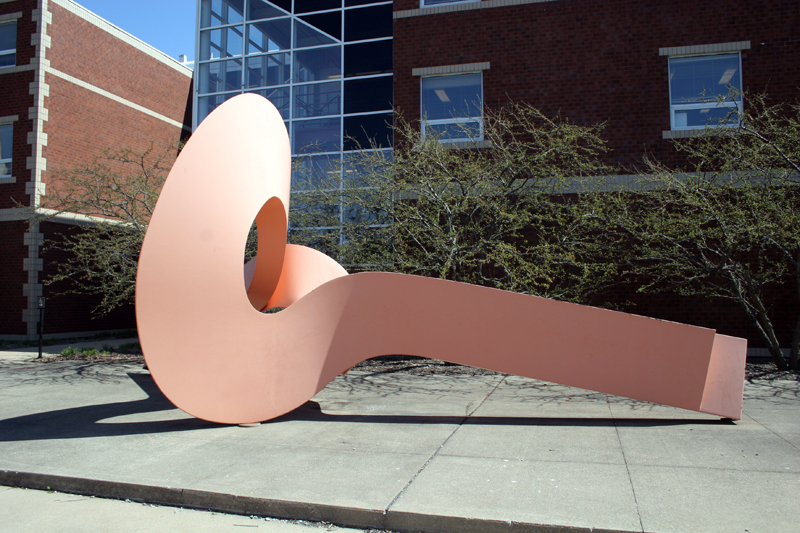 Bruce White (1933- ) created this welded and painted cor-ten steel sculpture. 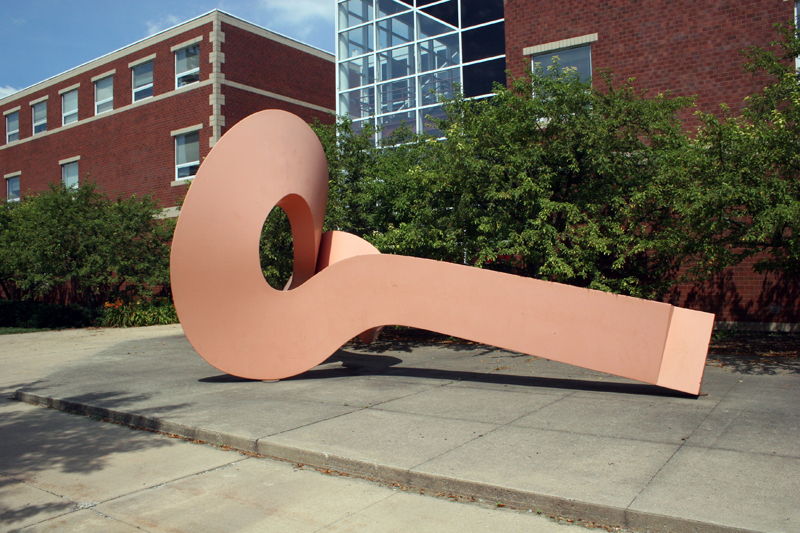 The 32-foot long sculpture is displayed on the west side of the Agricultural Engineering Sciences building. It was acquired through the Illinois "Percent for Art" program. Although White's 32-foot-long, Cor-ten steel sculpture complements its architectural setting, appearing as a fluid orange line sweeping through space, contrasting in form and spirit with the rather plain, factory-like brick structure behind it, it was not designed for the site. The first of his works to be fabricated at the Garbe Ironworks in the west suburban Chicago community of Aurora (hence the title Aurora I), it was originally displayed at Northwestern University in Evanston and later shown at the Illinois Transportation Building in Springfield, where, according to White's specification, it was sandblasted and painted. 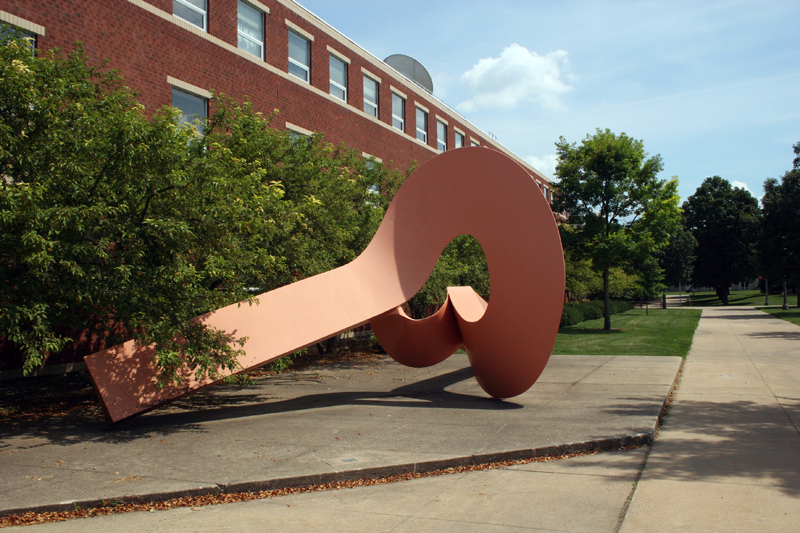 Under the "Percent for Art" program, the state then bought it for the university's Urbana campus. White uses industrial methods to bend heavy steel. For this 8,000-pound piece, workers stretched and twisted large, precisely cut metal plates into desired shapes by using overhead traveling hoists and cables and hydraulic jacks, among other means. White particularly likes to invent ways of using the mathematical Mobius strip, a continuous, one-sided surface formed by twisting one end of a rectangular strip 180 degrees and attaching it to the other end. The work "consists of two triangular strips that take off from a single point, then reverse to form a parallelogram," he explained. "The two triangular members then separate and reverse themselves, turn themselves inside out and come back together again. Actually, they're reversed in the opposite way at the other end-if that makes sense," he said. 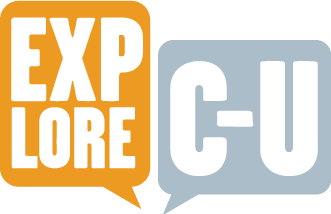 White earned master's and doctoral degrees from Columbia University and taught at City University, Queens College, and Adelphi University in New York; at Southern Illinois University, Carbondale; and at Florida State. Currently he is a professor of art at Northern Illinois University, DeKalb. His big commissioned works include a blue enamel aluminum plate construction for the Chicago Fire Department, Chicago Avenue and Lemon Street; a painted aluminum-and-steel sculpture at Quail Springs Mall, Oklahoma City; and an aluminum piece for the Willard Ice Revue Center, Springfield, Illinois. Muriel Scheinman, “Aurora I, 1980,” ExploreCU, accessed April 18, 2019, https://explorecu.org/items/show/32.